The Blue Magic solid state 300 watt waterbed heater gives you precise control over the temperature of your hardside waterbed mattress. 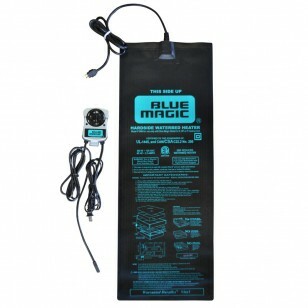 The Blue Magic waterbed heater comes complete with a solid state heater control and a premium wire alloy waterbed heating pad. Studies show that a temperature controlled sleep environment provides multiple health benefits and aids in achieving deep sleep. The medical benefits of heat therapy to improve circulation and penetrate muscles for recovery and relaxation is well documented. When compared to electric blankets, which can have significant temperature swings of several degrees that affect sleep, the Blue Magic waterbed heater offers consistent warmth within 1/8 degree of your set point.